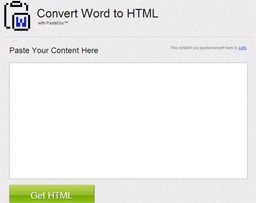 Need to convert Word content (or other rich text content) into HTML? Need to do it quickly and easily? Without the riffraff? Good to hear! Try my new site, PasteDoc.net where you can convert Word to HTML quickly, easily, and safely. Quickly and Easily Convert Microsoft Word to Clean HTML!